Landlords at every stage of their investment career can always benefit from a little extra information. That’s why we’re doing regular blogs and videos about all the topics that are relevant to owners and investors like you. We want to be your go-to resource. If you have questions, we have answers. Whether you’re wondering about the state of the San Diego real estate market or you’re not sure how to raise the rent – we have likely addressed your burning question in a blog. Check out our landlord tips below. Check out our videos and read our blogs for help with landlord issues, investment opportunities, and a general understanding of how to be a better landlord. Our continuing education provides you with numerous tools and resources. You’ll find a wide range of topics, but if there’s a particular question that you don’t see answered – share it with us! You might just see it in our next educational video. 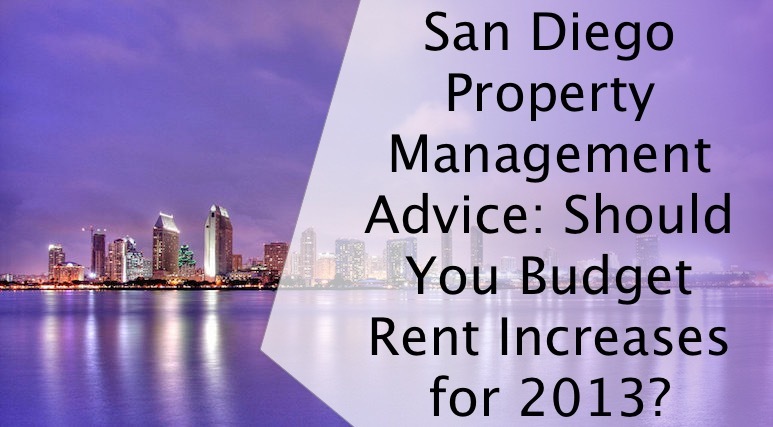 San Diego Property Management Advice: Should You Budget Rent Increases for 2013? Walters has been my management company of choice for over 10 years and I have appreciated their ability to find good renters for the properties they manage. When it has come to repairs or upgrades, they have contacted me before they are done to get my approval. I have found their contractors to be more than sufficient to do repair jobs. The renters have been excellent, which has a reflection on Walters research of a renters qualifications. Walter's home management help us move into our dream home in San Marcos! The professional and easy move-in was a huge breath of fresh air. They continue to be professional and offer online options for requesting maintenance and paying rent. It's so easy! Would recommend for sure to anyone looking for a good move-in experience. Communication has always been easy and straightforward with this company. They've gone above and beyond to personally work with us as tenants, making the entire renting process as simple and stress free as possible! We have a very long relationship with this company for about 15 years. We bought our first condo in Oceanside since 2003. At that time the Walters Management was managing the community that we lived and paid the HOA fee through them. In 2009 we moved to OH, we called the company and learned that they have a sister company; Walters Home Management that provided rental management services so, we decided to have them take care of our condo. We worked with Jennifer Newton and her team, they helped us fill the tenant quickly and each time that the tenant moved out they filled the new one right away without a gap of losing income. WHM took care on everything from screening the tenants, repairing and cleaning. All we remembered was that we were hassle free and we only just checked our checking account and the monthly income statement. When we moved back to San Diego, we rented the home through WHM again in 2013 while they still managing our condo. In 2015 we moved again to PA, we decided to sell our condo. We called Jenifer, she and the company’s realtor helped us sell our condo, just within 24 hours after put in the market it was sold!!! In 2017 we bought a house in San Diego. We called Jennifer again to find the tenant to rent the new house. Once we moved back to San Diego in 2018, we had to lease another house that was managed by the other company because the tenant still lived there at that time. But later they wanted to moved out before the lease expired. Since Jennifer is in the business for a really long time, she was able to communicate with the agent who we just signed the lease to help us get out of the lease and moved into our home. Jennifer also negotiated with our tenant to move out just in time that we had to move in. So, all parties ended up with the happy ending story. We are so thankful and lucky that we had a wonderful company that took care of us in every move. We can proudly say that we trust Jennifer and Walters Home Management team to manage our properties. I was lucky that the house I rented was managed by Walters Home Management. I found the property manager Jennifer to be very professional and accommodating of my initial requests. The communication with anyone in the office has always been good. The house was a bit old so issues would come up and they were always quick to respond to my requests. My lease ended last month and Brad was fair with my deposit. I bought a property which I have to live for one year. I intend to have them manage my property in the future. I rented a condo through Walters Home Management in Downtown San Diego. The team at Walters is great to work with. They are great advicates for their tenants. All service issues were addressed quickly. I really like their online system for paying rent. If you’d like to learn more about our properties and what it’s like to work with Walters Home Management, get in touch. We’d be happy to talk more about our rental properties, our application requirements, and our leasing process. Walters Home Management specializes in the leasing and management of individually owned single family homes and condominiums in the greater San Diego area. Our current portfolio represents hundreds of satisfied clients. We're ready and willing to put our experience and energy to work for you.